We take most the hardware in our homes for granted – at least, until it becomes a problem. Faucets, window latches, closet racks, door knobs. You normally don’t even notice them, you just use them. Wall plates fall into the same category; as long as you can plug a cord or cable into them and they work, you never give them a second thought. That’s probably why many people updating their audio/video setup or putting in a new home theater never think about installing in-wall HDMI cables and wall plates. They just run the HDMI cables connecting their components behind furniture, along baseboards, or (heaven forbid!) across the floor. There are three reasons not to do that: safety, performance and aesthetics. The safety consideration is obvious; people have a nasty habit of tripping over exposed cables, and most babies and pets can’t resist tugging on an interesting-looking wire. Performance is a related problem, since connectors attached to a cable that’s been pulled, tugged or twisted can easily break. Aesthetics are a different story. A home theater should look clean and elegant, because that adds to the experience of settling in to enjoy a movie or listen to music. A jumble of wires, or cables scattered all over the place, make the room feel more like a college dorm than a professionally-installed home theater. In two words: neatness counts. And in three words: HDMI wall plates. When it comes to installation, HDMI wall plates are no different than the power outlets you have all over your house. You simply screw the plate into any single-gang junction box or plaster ring (which are easily placed into drywall or plaster). Naturally, you can’t plug a lamp into an HDMI wall plate, since it has HDMI ports and not power receptacles. But you can plug in any HDTV, video component or other equipment that supports now-standard HDMI technology. And just as with a power outlet, it takes just a second or two to make the connection. What’s happening on the “other side” of the wall? That’s simple, too. The best HDMI wall plates (like the ones we feature at Cmple) either have mirror-image HDMI ports on the back, or ports attached to the plate by four-inch extension cables. Each makes connections a snap; there’s no need to fiddle with wires and terminals, and you don’t have to strip cables and attach connectors. On both sides of the wall plate, everything is just plug and go. That makes HDMI wall plates incredibly useful. When installing or remodeling a home theater or A/V system, all you have to do is run a length of HDMI cable through your wall (or ceiling) and plug each end into the HDMI ports on the back of the wall plates. Presto! You can now connect HDMI components instantly without having to run cables between them. It’s short-sighted to run just one HDMI cable through the wall, though. After all, you wouldn’t install just one power outlet in a room and connect everything to it with extension cords. Multiple HDMI wall plates situated throughout a home theater give you the ability to hook up your components, wherever you want to put them, while keeping things neat and clean. What do you plug into a HDMI wall plate? We’ll look at that next. Two of the great features of HDMI cables is that they’re bi-directional and backward compatible; you don’t have to find the “right end” of the cable to attach, and you can connect any HDMI-equipped HDTVs or components no matter how old or new they are. In other words, HDMI is tremendously versatile. Once you’ve installed HDMI wall plates throughout your home theater or elsewhere in your house, they can be used to send video and audio signals between any two HDMI components. The most common connection in most home theaters, of course, is between a video monitor and its primary video source. The usual approach is to position the HDTV in close proximity to the source (for example, a cable or satellite box) so a stock HDMI cable will reach. But what if the monitor is hung on a wall? Hard-wiring is a possibility, but installing an HDMI wall plate behind the monitor gives you the flexibility to easily swap out video sources (like streaming video boxes or gaming consoles) and connect them directly to the monitor. Additionally, it lets you position your video source or receiver anywhere in the room that’s convenient. 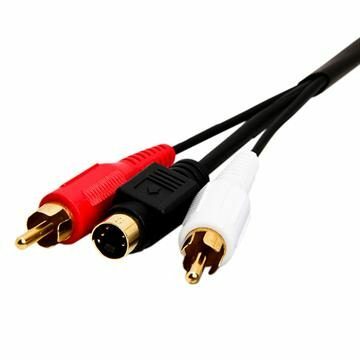 HDMI cables are also regularly used to connect components like Blu-ray players to A/V receivers or HDTVs. When you have several HDMI wall plates installed throughout your home theater, you can place the components wherever you’d like and move them whenever you’d like – for example, if you add new furniture or accessories to the room. Cmple carries the four most common types of HDMI wall plates, each designed for a specific application. Single-port HDMI wall plates: These plates have a single HDMI 1.3 port on the front, connecting to a single port on the back which is attached by a four-inch extension cable. Dual-port HDMI wall plates: Similar to a standard two-plug AC wall plate, these HDMI plates have two HDMI 1.3 ports on the front (for two separate connections), with the rear ports also attached by four-inch extension cables. 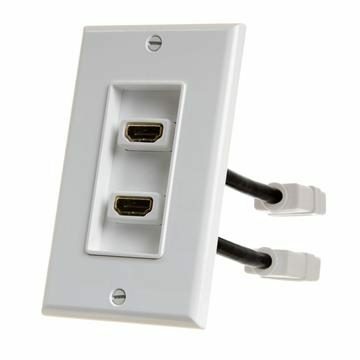 Single-port HDMI plus three component video jack wall plates: The addition of three component RCA video jacks to a wall plate with a single HDMI port is a great way to ensure connectivity. If the HDMI port on your monitor fails (or the cable inside the wall breaks), you can still send HD signals to your HDTV via component connections. You can also hook up two separate components at the same time, one with HDMI and one with component video cables. The RCA jacks have mirror-image jacks on the rear of the plate. Single-port HDMI plus three composite AV jack wall plates: Similar to the plate just described, the RCA jacks are installed right under the HDMI port and can be used for whatever analog A/V connections you need to make, such as stereo audio. All of Cmple’s HDMI wall plates are manufactured to exacting specifications, to ensure high-quality. The plates are white but compatible with the Leviton Decora line, so it’s easy to swap them out to match your décor. All connectors are gold-plated to protect against corrosion and provide the most secure connections possible. And as always, you won’t pay a lot for Cmple quality; our reasonably-priced HDMI wall plates are a bargain.